So, the other day I was scrolling my Twitter feed when the following post that filled me with a wee bit of silent rage: "Damien Chazelle makes musicals great again." Never mind the sickening Trump reference (how much longer until people get tired of using his third grade slogan for every situation?). The sentiment has the audacity to compare writer/director Chazelle's millenial charmer LA LA LAND to actually amazing musicals, presumably in the realm of West Side Story, The King and I, Grease, and even Chicago. You know, classics. First of all, we're obviously grading on a steep scale for the new generation. But that's just my point: how far has the movie musical fallen that we are claiming this early awards charmer starring Emma Stone and Ryan Gosling the second coming of Jesus H. Christ? Don't get me wrong, LA LA LAND is fun and cutesy, and made me leave the theater with a big, goofy smile on my face. But there's one distinct difference between good movie musicals and great movie musicals: with a great movie musical, you can strip all the song and dance numbers from it and it can still be great. Because it has a great story, great dialogue, pitch perfect performances. LA LA LAND is wonderfully shot, which bodes extremely well for its gigantic opening number featuring a highway-full of disgruntled drivers trapped in a traffic jam. 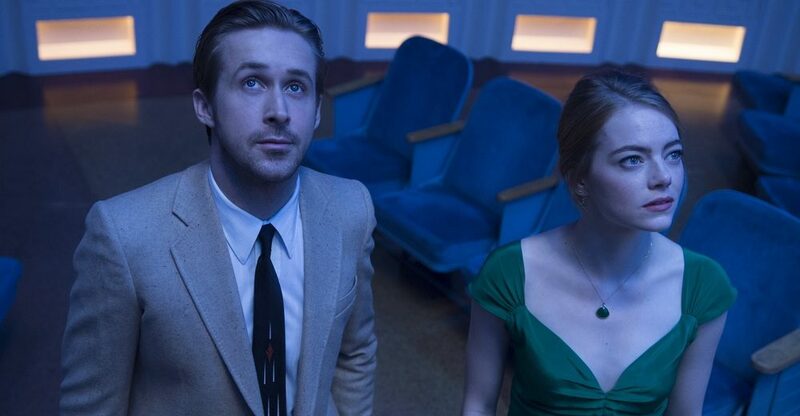 Its stars are thrilling to watch because Gosling is impossibly handsome and playing Sebastian, an impossibly handsome and sentimental bachelor with swoon-worthy jazz skills. 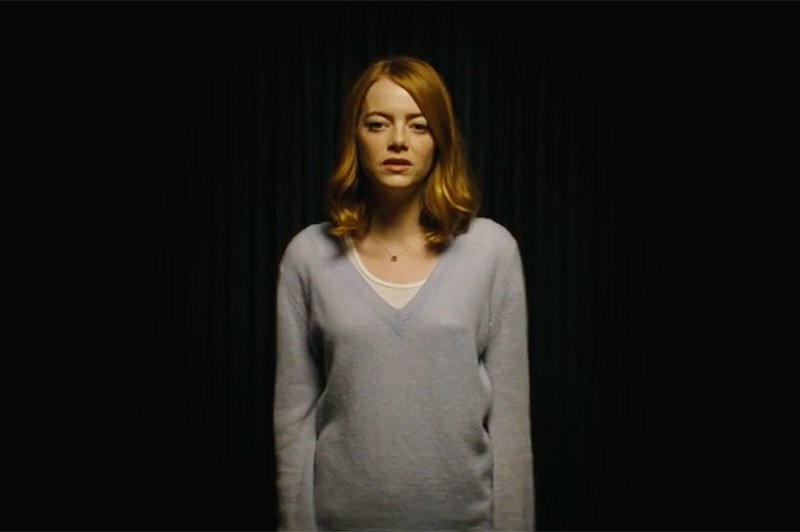 And Stone has an incredibly theatrical face whose expressions could be seen from outer space, which makes her portrayal of Mia, a self-deprecating wannabe actress, more hilarious than perhaps she should be (yet also really appropriate given the theatrical nature of the film). But what about the story? Well, take away the song and dance, and there is very little substance. Both characters are underdeveloped (though Stone seems to do a lot more with her character than Gosling does). Sebastian and Mia just aren't interesting enough on their own. It's their courtship, held together by their similarly deteriorating Tinseltown dreams, that keeps you somewhat invested. But for the most part, you're just waiting until the next dance number. It's a shame, really. Because we are long overdue for a great movie musical. But this one just isn't it, no matter hard it tries (and it tries really hard). I do hand it to Chazelle for creating a west coast version of a Woody Allen film--complete with nostalgia, neurosis, and creative desperation (along with truly glorious shots of the city). He clearly has an eye for what makes a musical look good. He even decorates it with splashy, colorful, costumes (big, bold yellows and zoot suit flair). But if you were to ask me to pinpoint a great moment in the dialogue, I'd be hard pressed. While Stone nails the film's climax at Mia's final audition, bringing her story full circle (and reminding us that it is her performance that is essentially carrying the film at this point), this gravitas needed to come a lot earlier. I just wanted more. While I'm happy that LA LA LAND has gotten people excited about talking about movie musicals again. I'm more interested in what's to come. Is this were we are with movie musicals now? Lame live action TV adaptations of classics and inspired yet half-baked millenial-friendly movie musicals? I'll pass. I'm so psyched for this movie but comparing it to Woody Allen gives me pause. I hated Woody Allen films. Now I'm a bit scared lol. My big issue with this movie, and most modern musicals, is that it can't escape the simple fact that its leads can't dance. I would rather watch a musical starring dancers who can't act than one starring actors who can't dance. I'm struggling to think of a mainstream actress who can dance, but I would have loved to see Tatum or Timberlake in the Gosling role.